How cute is it that her nickname for Phelps is Giggles? So sweet. I'd also like to redirect your attention to the fact that little Boomer has his own Instagram handle. Of course his parents likely post for him (no newborn is that tech-savvy), but it's still impressive that the kid already has 14,500 Instagram followers. That's significantly more than I will ever have in my life and he hasn't even hit his first birthday yet. That's almost impressive as his dad's Olympics record. Almost. Here's the adorable family photo. Even though he doesn't have any teeth yet, there's no denying that's a giant grin. And showing that he truly earned those 14.5K followers, here's a post from Boomer himself. My heart can hardly handle the cuteness. 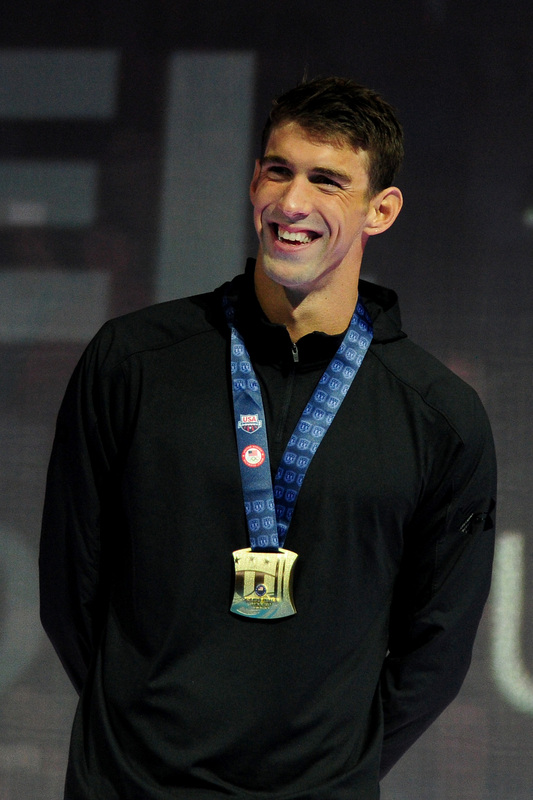 Congrats to Phelps for not only having such a cute baby, but for making it to the Olympics — again. Obviously that's the main accomplishment here, but it'd be remiss to ignore how special it is that Boomer was there for his dad's historic moment. I can only imagine all of the adorable snapshots to come when the actual Olympics start. Something tells me that Boomer will continue being part of Phelps' cheering section. And chances are, he'll be his good luck charm.